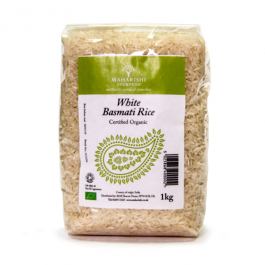 This combination of basmati rice, peeled and halved mung beans with vegetables and spices, is considered, in Ayurveda as the ideal formula for a light, full and satisfying meal. Suitable for cooking with your own choice of vegetables. Short boil a portion (80 g) of Kitchari mix in about 300 ml water. Cover set and simmer over a low heat for 20-30 minutes then leave - stirring occasionally. After about ten minutes add small chopped vegetables of your choice - such as carrots, peppers, fennel, Zucchini. Then season to taste with salt and butter or ghee. Kitchari is basic to the Ayurvedic way of life. Composed of basmati rice and mung dal, it has as many variations as there are cooks who prepare it. A one-pot dish, kitchari originates on the Asian subcontinent and has references dating back thousands of years. The skilful use of spices and vegetables can produce balancing effects for the three bodily doshas. It has many qualities but being quick and easy to prepare makes it a popular dish for almost every lifestyle. Basmati rice and mung dal together create a balanced food that is a good protein combination and is tridoshic. This complete food is easy to digest and gives strength and vitality. It nourishes all the tissues of the body. 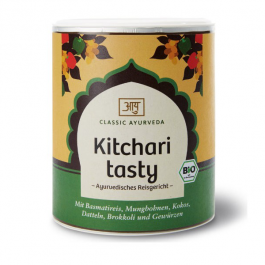 Kitchari is the preferred food to use when fasting on a mono-fast or while going through cleansing programs such as panchakarma. 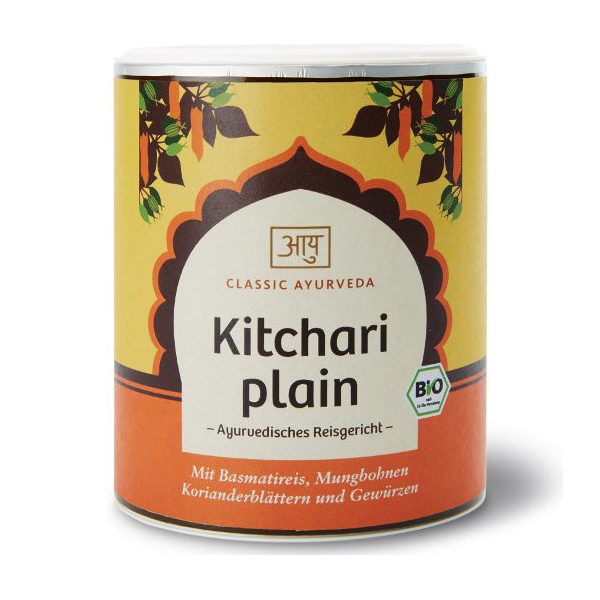 Kitchari is excellent for detoxification and de-aging of the cells. A warm, tasty lunch or evening meal from the tradition of Ayurveda - cooked in a few minutes.